We’re having a curry lunch at work tomorrow and we’ve been asked by the work colleague hosting the curry lunch to bring anything that we think will go with curry. I’ve decided to bring roti bread (shop bought as I haven’t learned how to make them yet!) and pistachio, coconut and cardamom burfis. I’ve always liked Indian food, but I must say that I’ve never really had proper Indian food until I moved to the UK. One of the consultants who used to work for the government corporation I used to work for in the Philippines used to bring us Indian-inspired dishes and she introduced me to roti bread which I am now in love with! Anyway, apart from the adorable roti bread, I’m bringing pistachio annd coconut burfis to work tomorrow. A burfi (or barfi or burfee, or borfee) is a sweet confectionery from India. It is usually made with condensed milk cooked with sugar until it solidifies. I saw this version being made about 5 or 6 years ago on a food-related channel on the Discovery Travel and Adventure channel. It wasn’t until about 4 years ago, when I moved to England, funnily enough, that I had the opportunity to try making this recipe. On the programme I was watching, it looked easy to make, and it was—very, VERY easy to make. Most burfis ask for the condensed milk to be cooked in sugar until they harden, but as I am diabetic (and very lazy), I thought I’d try it without the long cooking process and the added sugar. The condensed milk is sweet enough! In a small food processor, roughly chop the pistachios until they resemble small shards. The chopped pistachios don’t have to be too processed because you do want to be able to bite into the occasional chunky piece of pistachio. Remove the seeds from the cardamom pods and, using a mortar and pestle, grind the seeds into a fine powder. I find this particular part of the preparation very therapeutic! In a large bowl, combine the 200 grams of the dessicated coconut (reserve 50 grams to roll the burfis in later), the chopped pistachios, the ground cardamom seeds and the condensed milk. Mix until everything is well combined. With lightly oiled hands (because the condensed milk is very sticky! 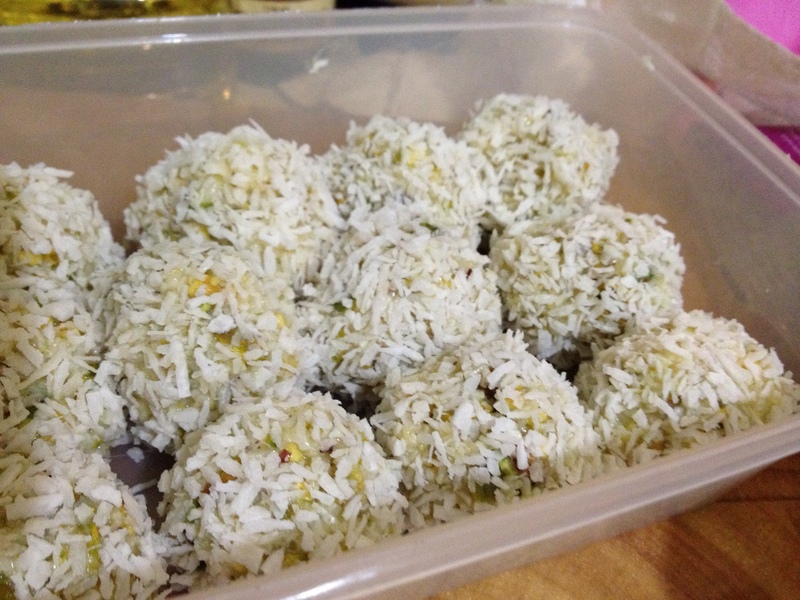 ), scoop enough of the pistachio-condensed milk-coconut mixture to make a ball that’s about 1inch in diameter. Once the balls are formed, roll them in the dessicated coconut you reserved. Place on a plate or box to store. The burfis can be eaten as soon as they are made but it’s much nicer if you refrigerate them for at least 2 hours before you serve. These keep in the fridge for about a week. Although, I very much doubt that they’ll last that long as they’re very moreish (moreish, or more-ish, is a word I learnedafter moving to England. It means causing one to want more–usually food! )!